First produced in 1997 by Modo & Modo SpA in Milan, Moleskine — produced by the eponymous Italian parent company since 2007 — is an extensive line of pocket-sized, trusted travel companion notebooks with over 14 million units sold in around 23,000 points-of-sale, including nine branded stores, in 90 countries across the globe. Between the classic notebooks and all its variants — small, large, ruled, squared, plain, colored covers — and dozens of special editions Moleskine’s collection includes over 750 products. Earlier this month Moleskine introduced a new monogram and a revised wordmark desiged by Milan-based Achilli Ghizzardi Associati. 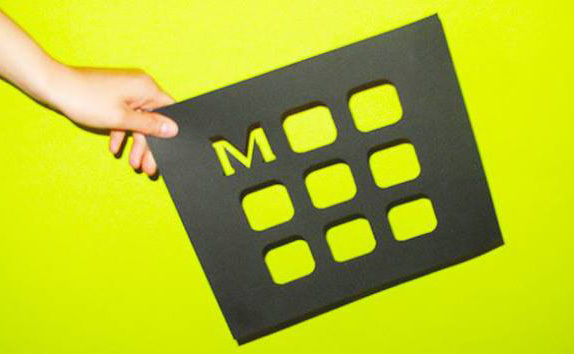 A set of nine modules consisting of the M of Moleskine and eight rounded squares come together to form a grid, evoking the essential design elements of the Moleskine notebook with its rounded corners as well as those of the digital realm. 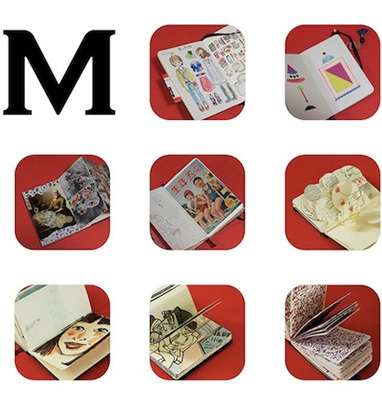 Each module is a flexible space that can house a wealth of content: the letters of the company name, the colors and configurations of the collections, community creations and multimedia content will all fill the new Moleskine monogram. Animated GIF presenting the new logo. “Sketches” of the new logo. In quotes because this image couldn’t be any more Photoshopped unless it had Kim Kardashian on it. 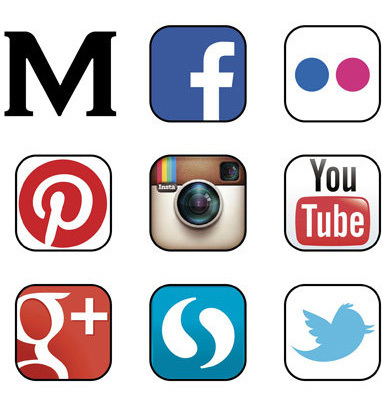 The new monogram presents the brand as designer of open platforms for creativity, communication and sharing. […] Tthe intention was to create a fluid visual icon that communicates its multi-faceted and open nature while unifying its many objects, types of users and brand values. Monogram detail, above. With stuff, below. Re: the above image. Shoot me now. The logotype remains unchanged apart from a more emphasized roundness to the curves of the letters, creating a proprietary font for the first time in the company’s history. 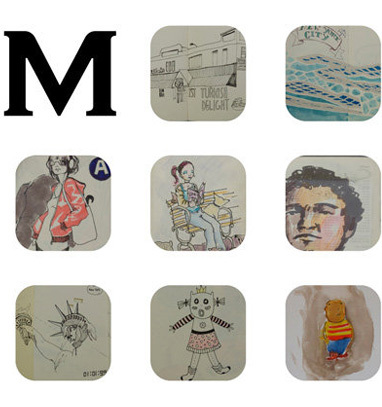 Particular attention has been given to the letter M, which becomes the pivot for the whole visual identity. Detail of the wordmark. Apologies for fuzziness, it’s the best I could find. If it were designed today, I would vehemently complain about the old wordmark being set in the overused and underwhelming Copperplate Gothic but, now, compared to the atrocious update to it, I find the simplicity and established ubiquity of the old one a major loss. The new wordmark takes out all the edge and crispness of the old and sands down every corner down to a stubby soft corner, while getting rid of inward serifs that provided necessary balance. A major downgrade. 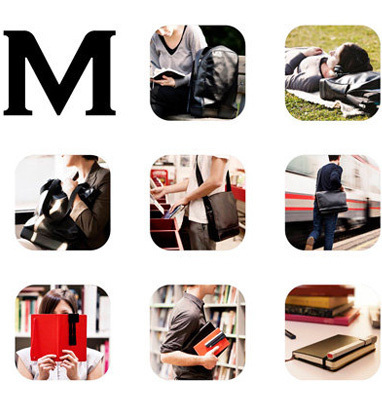 Then there is the new monogram, that takes the new “M” and places eight rounded squares (that mimic the rounded corners of the notebooks, see?) around to create a 3-by-3 grid. It’s not totally a bad idea, but why squares? As far as I can tell, there isn’t a single square Moleskine out there and it’s not like every logo should replicate its product or history but the disconnect here is quite obvious and flawed. The monogram then uses the logo-as-window in the most obvious and boring ways, kind of ruining that maneuver for the rest of us. Finally, the monogram is used in tandem with the new wordmark, where it becomes so small to be unreadable. Overall, a very disappointing evolution, specially considering the product’s popularity and embrace in creative industries. It deserved better. Thanks to Yotam Hadar for first tip. First produced in 1997 by Modo & Modo SpA in Milan, Moleskine — produced by the eponymous Italian parent company since 2007 — is an extensive line of pocket-sized, trusted travel companion notebooks with over 14 million units sold in around 23,000 points-of-sale, including nine branded stores, in 90 countries across the globe. Between the classic notebooks and all its variants — small, large, ruled, squared, plain, colored covers — and dozens of special editions Moleskine's collection includes over 750 products. Earlier this month Moleskine introduced a new monogram and a revised wordmark desiged by Milan-based Achilli Ghizzardi Associati.